Stunning views of Europe's largest active volcano, often capped with snow, sweeping sea vistas that stretch as far as the eye can see and gardens full of the colours and aromas of bougainvillea, lemon trees and jasmine - all combine to create one of the most enchanting destinations in Italy. This small group escorted tour takes in some of Sicily's most beautiful sights. Start with a stay in Taormina and an excursion to Mount Etna before visiitng the baroque towns on the south east. 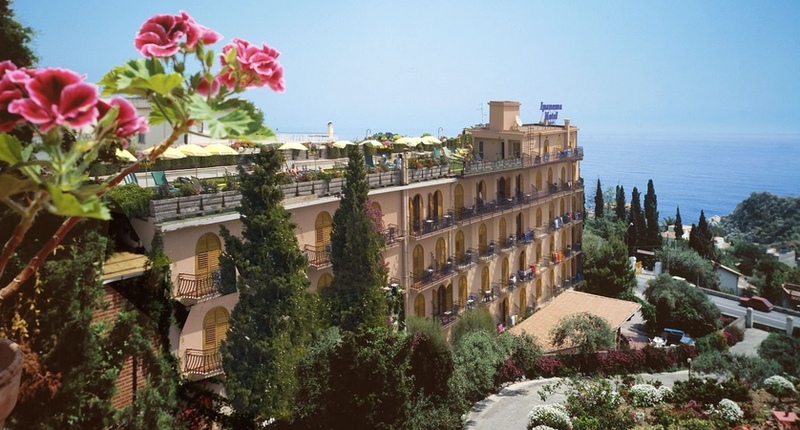 The Eurostars Monte Tauro is a lovely modern hotel, which is set into the cliffs and offers fantastic views of the sea. 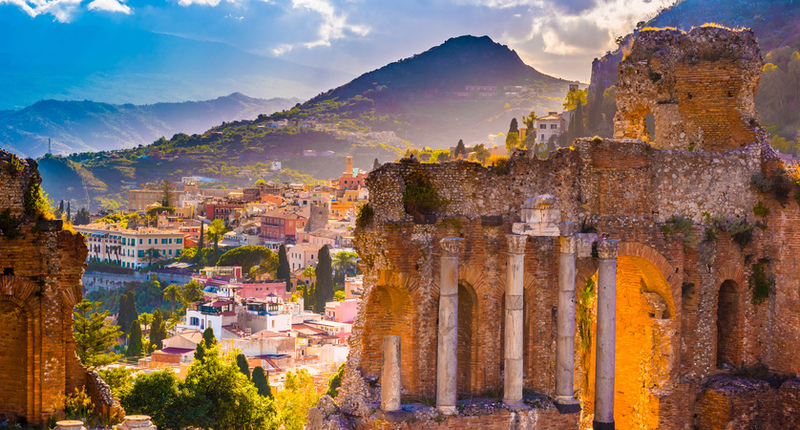 The centre of Taormina can be found only a few minutes walk away where plenty of shops, bars and restaurants can be found. 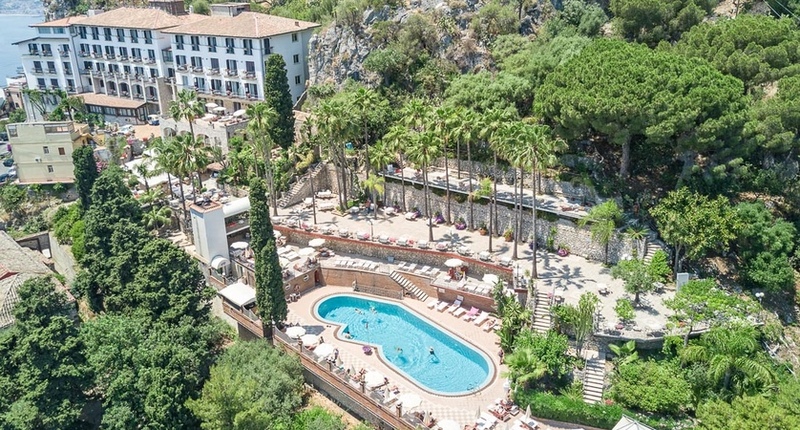 The Ashbee is an elegant, luxury hotel in the heart of Taormina, surrounded by lush gardens and citrus trees and with amazing views over the coastline. Hotel Villa Sonia is a family run property, set in a quiet location, 10 minutes walk away from the village of Castelmola. 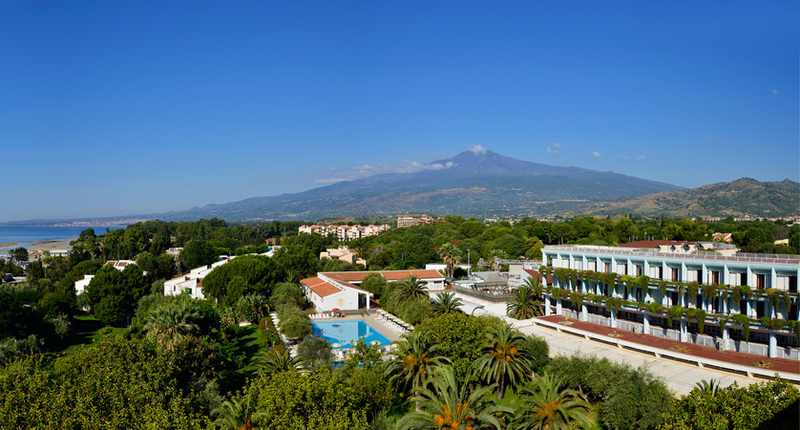 Guests can relax and unwind, while enjoying the mesmerizing views of Mount Etna. The Grand Hotel San Pietro is an elegant hotel which can be found in a quiet area of Taormina, just 15 minutes walk from the centre. The hotel is surrounded by lush greenery and stunning sea views, which can be seen from the hotel terrace and swimming pool. This small and friendly hotel is centrally located right in the centre of Taormina, near to the old town and the Greek theatre. The Atahotel Capotaormina is a prestigious hotel which overlooks the Giardini Naxos Bay and is surrounded by a gorgeous landscape. 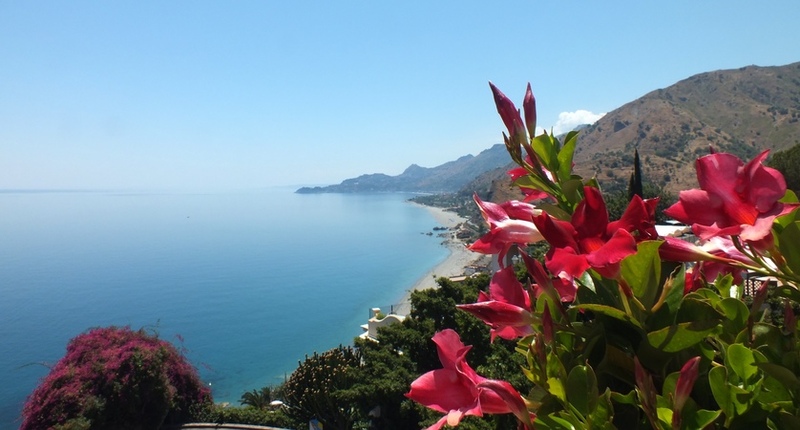 It is located 3km below Taormina, which can be reached by taking a shuttle bus. 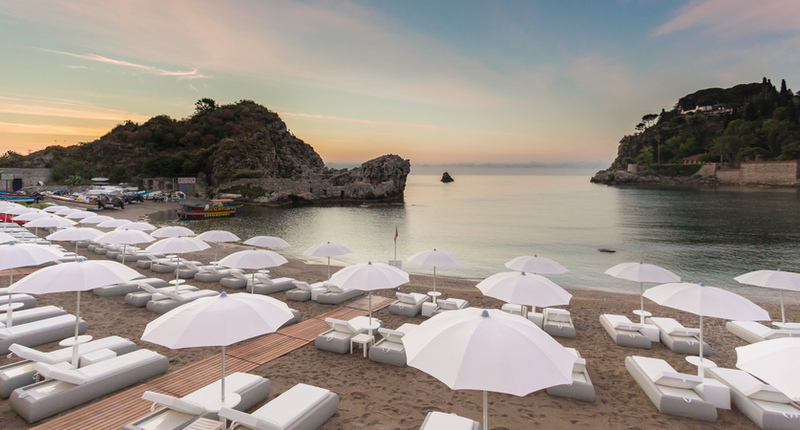 The Hotel Atlantis Bay is a luxurious retreat built into the cliffs of Taormina Mare with terraces that descend towards the sea and has incredible views over the bay. 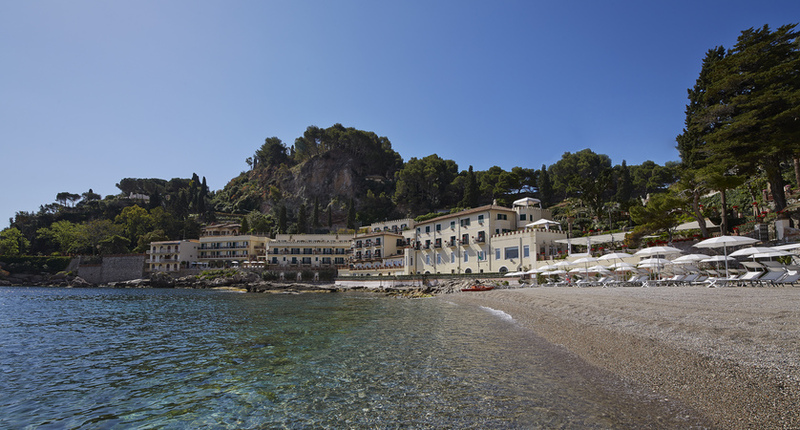 A stunning property on the edge of the Bay of Mazzaro, Belmond Villa Sant’ Andrea has been lovingly restored from an aristocratic villa into one of Taormina’s best hotels. 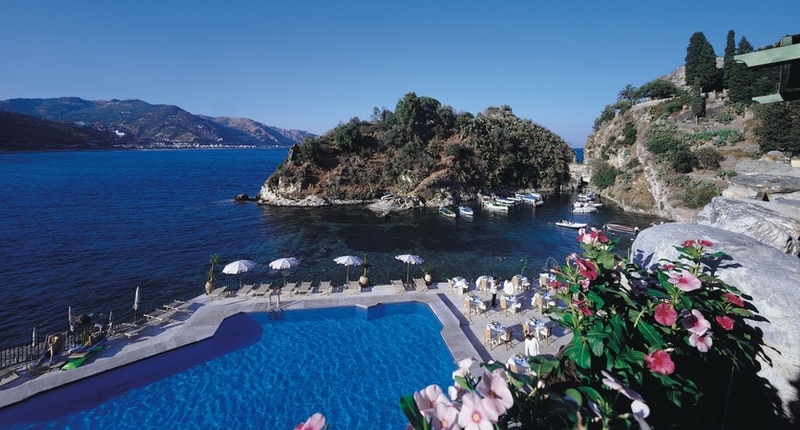 The Grand Hotel Mazzaro Sea Palace is located just below the old town of Taormina, on the Bay of Mazzarò. The hotel is a great place to stay for those wanting to get away and relax, with its stunning views, attentive service and Hyd’or Spa, shared with its sister hotel, the Atlantis Bay. The Villa Diodoro is a lovely hotel, located on the hillside, surrounded by lush gardens and amazing views over the Bay of Naxos to Mount Etna. 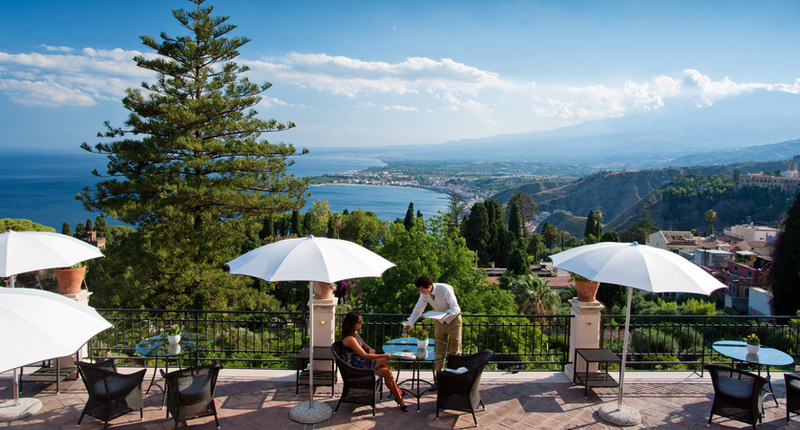 As Taormina’s oldest hotel, Belmond Grand Hotel Timeo has the best location in the town with stunning views over the bay and Mount Etna. Its renowned literary bar has inspired some of the world’s greatest authors and its superb restaurant is one of Toarmina’s finest. The Hotel Ipanema is in a great location, close to the cable car in Taormina Mare, which takes you up to the city of Taormina. Panoramic location and only 400m from the centre of Taormina, perfect for those wanting to explore the historical city and island. An impressive complex located directly on the beachfront, offering an array of activities to keep all of the family entertained. An authentic Sicilian hotel in the seaside town of Giardini Naxos where you can relax and soak up the Mediterranean Sea. The RG Naxos Hotel boasts a prime location right on the beach and is close to all major attractions on the island. Perched high on the cliff tops of Forza d'Agro, Hotel Crystal Sea undoubtedly offers some of the best views the Taormina region has to offer. Located just 7 kilometers from the center of Taormina itself, this art deco style building boasts a private beach and onsite restaurant. 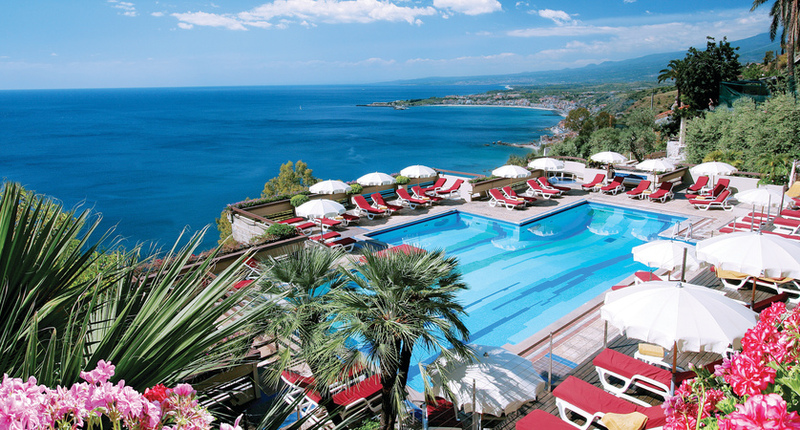 A hotel situated at the top of a holiday complex, boasting stunning views across Taormina Bay. This awe inspiring excursion will take you on a journey along the South Coast of Sicily to Agrigento, known as Akragas in the past, a place in which one of the most influential civilisations of ancient Greece flourished. Explore the archaeological site and discover the ruins of the ancient temples, some among the best preserved in the world, Concordia, the temples of Juno, Zeus, Hercules, Vulcano and the ruins of the temples of Castor and Pollux. The journey continues towards Scala dei Turchi and its white marna cliff formations on the south coast of the Island. Its name is translated to ‘Stair of the Turks’ due to the ladder like rock formations that undulate across the landscape. This unique striking landscape is one of the Seven Natural Wonders of Italy. There are two sandy beaches surrounding the cliffs that you can make your way down to (comfortable shoes are highly recommended). Pack your swimsuit, towels and sun cream so that you can take a moment to relax by the glistening emerald ocean before making the trip back to Taormina in the late afternoon. This trip takes you on an adventure to Europe’s largest and most active volcano. To reach the towering Mount Etna from Taormina, take the highway (about 20km) until you reach the mountain road that meanders through the villages of Etna and the surrounding fields of vineyards, olive trees and fruit trees. As you ascend the mountain road through a continuously changing landscape, a chestnut and pine forest closes in at an altitude of 1000 metres, before opening up into a volcanic lunar landscape at 1900 metres. From the carpark you can take a short trek up to the Silvestri Craters that formed as a result of the eruption of Etna in 1892. There is also a cable car up to the spectacular viewpoint at 2500m. If you are feeling even more adventurous you can join a Jeep and mountain guide that takes you to the foot of the mountain crater at 2900m where the black volcanic landscape intensifies into a kaleidoscope of red ionised rock, white ashfall and yellow sulphur. This extension depends on the activity of the volcano and the weather conditions. During your visit to Mount Etna there will be time for lunch at the base of the cable car where there are small souvenir shops and self-service restaurant. As you head back towards Taormina you will have the chance to see the stunning lava prisms at the Alcantara Gorges. The black lava walls that tower above the glistening Alcantara River, have been formed from the lava cooling process and water erosion. A stairway leads you down through the gorge or you can descend through the canyon via a lift. Take a trip from Taormina through the heart of Sicily to Palermo via the Catania-Enna-Palermo (about 280 km). Once you reach the Capital of Sicily you will find yourself in the political hub and cultural centre of the Island. Palermo is at the crossroads of the Mediterranean and as a result, is a melting pot of many influences. First stop is the magnificent Cathedral of Monreale, a visual culmination of these influences with its mix of Western, Byzantine, and Islamic architecture. Its original building was constructed on the orders of King William II of Sicily and dates back to 1182. The majestic building is set on the hillside overlooking the city’s centre in a striking and strategic location that assured that the residents security and defence. Famed for its intricate mosaic finish that covers almost the entire interior from floor to ceiling with geometric patterns and rich figural decoration, it is a sight to behold. You will have the option to visit the adjacent cloister on the southern side of the cathedral, which is part of the original monastery building. The beautiful baroque town of Syracuse is known for its ancient ruins and stunning architecture. You’ll get to explore the thousand-year-old history of the town on this excursion, starting with the incredible cathedral that dominates the piazza. After a short walk, you’ll arrive on the seafront promenade to admire the Arethusa Fountain before getting some free time for lunch. With Syracuse’s daily market filled with fresh food and plenty of family-run trattorias and cafés, you’ll be spoilt for choice. After lunch, you’ll stop at the archaeological park before heading to Noto, which has been declared a UNESCO World Heritage Site thanks to its maze of beautiful baroque buildings. This full-day excursion takes you north to the stunning Aeolian Islands. Heading to the port town of Milazzo, a comfortable ship will take you to Lipari via the Punta Castagna - a beautiful area of old Pumice Pits and white beaches, where you can admire the charming landscape and the crystal-clear waters. On Lipari you’ll get to visit the old town and archaeological park before having some free time for lunch or a spot of shopping. Next on the agenda is Vulcano, an island known for its black sand beaches, hot springs and mud baths. Before heading back to mainland Sicily, you'll enjoy an hour and a half's sail around the islands to view the Faraglioni, Papa Giovanni rock, the Grotta degli Angeli and the Scoglio della Mummia. On the way back to Milazzo, the boat will pass near the picturesque village of Gelso to admire the ancient lighthouse. After departing Taormina, you'll drive to Milazzo and board a boat directly to Panarea, one of the Aeolian's most fashionable islands where luxury yachts fill the tiny harbour and some of Italy's most elite sip prosseco in bustling cafés. You'll have two hours here to wander around - visit the picturesque village, take a swim in the crystal-clear waters or stop for a bite to eat. The afternoon takes you to Stromboli, where the smoky volcano dominates the sky. You'll have time to explore before leaving at sun set when you can admire the 'sciara del fuoco', the stream of fire, created when the lava flows down the active volcano.